By the time Christopher Wren was commissioned to build a rest-home for the nation’s elderly seadogs — essentially the navy equivalent of the army’s Royal Hospital in Chelsea — Greenwich was a sorry sight; an abandoned building project. The old, red-brick medieval Greenwich Palace, of Henry VIII and Queen Elizabeth I had essentially died during the English civil war. Charles II had grand plans for a glorious new palace, but as usual, the spendthrift monarch ran out of cash halfway through the job. For the decrepit sailors’ retirement home, Wren fancied something along the lines of Les Invalides in Paris but was told he had to keep the bit Charles had already built (now the King’s House). Oh, and the queen wanted a river view from her palace (the Queen’s House) so no demolition and no giant blocks, okay? 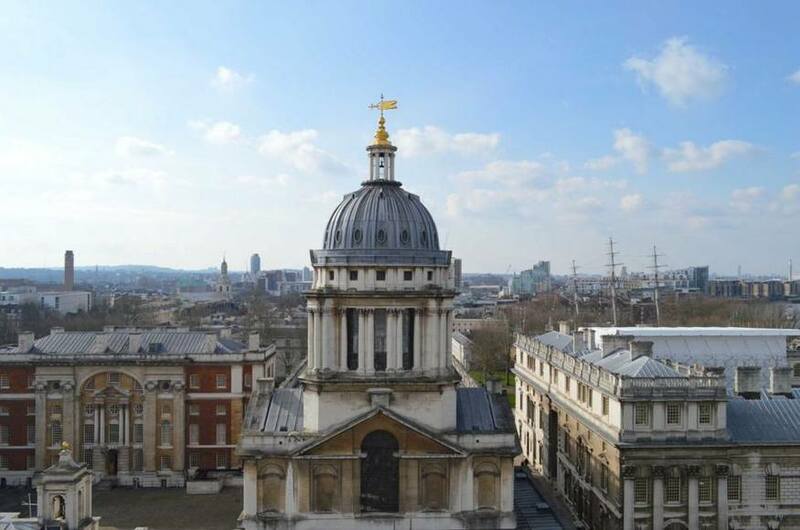 Wren came up with a series of four symmetrical courts, with two grand buildings in the middle to actually frame the Queen’s House, each with a dome similar to the one he had just created at St Paul’s. 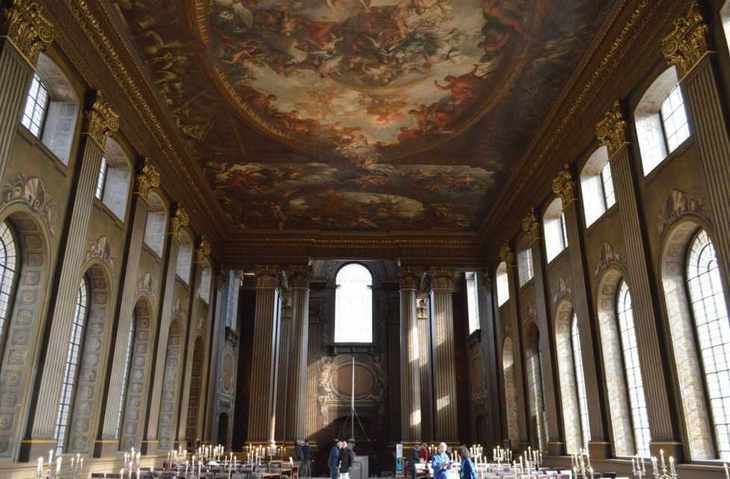 One of those grand buildings, the Painted Hall, was designed as a mess room but by the time Sir James Thornhill (who was famously paid by the yard for his exquisite murals) finished, it was considered far too grand for dirty old seafarers. 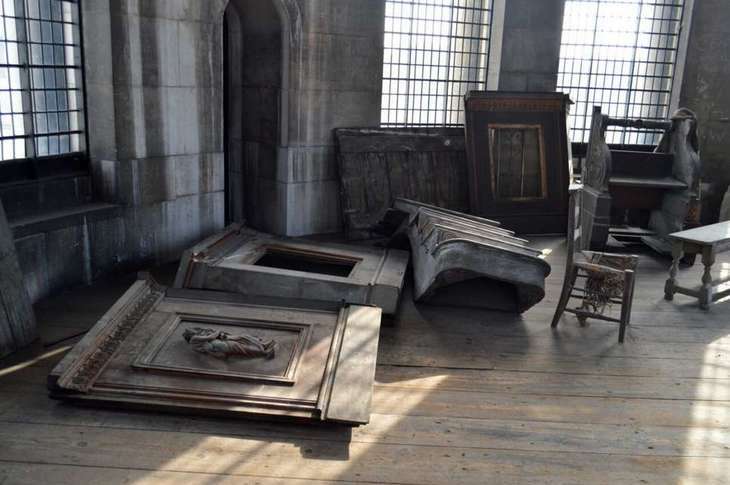 They were sent to eat downstairs in the undercroft, and the hall was turned into an art gallery. Over the years the once-luminous Painted Hall has become tatty. Sunlight, hard-knocks, cigarette smoke, candle grease, wind, rain and other elements from the main door opening directly onto the painted area — not to mention an internal drainpipe that’s been merrily leaking into the wall — have all taken their toll. The ceiling, especially, sulks under a cataract of gloom. Entire figures — including a snarling lion, random cherubs and the king of France being trodden on by King William III — have all but vanished under yellowing varnish. A massive £7m clean-up was recently completed, when the west wall was, at last, reminded it used to be colourful. The result is startling, the pigments are fresh and the gilding gleams — but just makes everything else look even dingier. Visitors walk in, glance up at the foggy figures on the ceiling, then head off in search of a pizza. Poor lighting doesn't help: a newly-cleaned trompe l’oil arch showing 'the view outside' is almost impossible to see thanks to two blinding spotlights aimed at something else. The scaffolding has since gone up again to allow work on the ceiling. 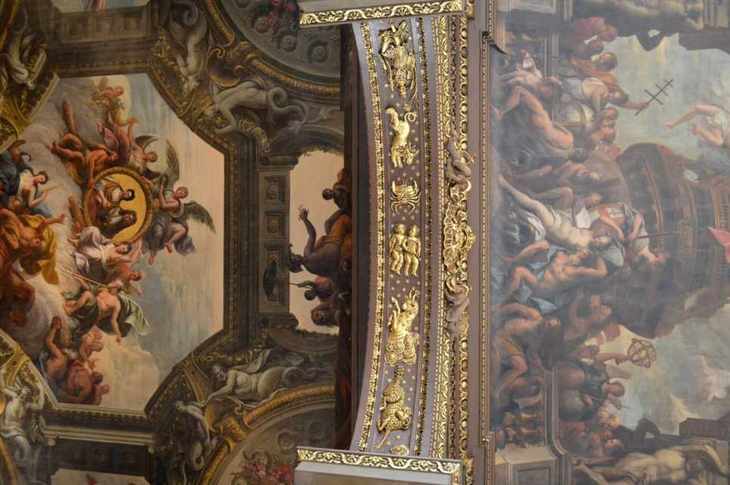 Both the Painted Hall and its opposite neighbour, the Chapel of St Peter and St Paul, have undercrofts. To look at them today you’d think the one under the Painted Hall, where the pensioners ate, was about half the size of the one under the chapel. It’s not. When the pensioners moved out, one end was bricked up and turned into an industrial-sized kitchen for the new Naval College. 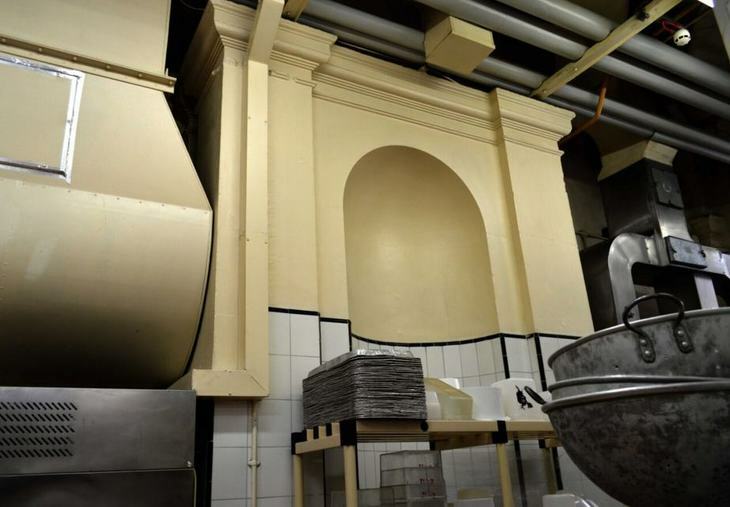 The Doric columns, arches, niches and vaulting were left — albeit covered in 1930s tiling, thick coats of institution-yellow paint, Health & Safety notices and giant steel shelving units. As part of the restoration, the nasty partition wall and 20th century clutter is going, taking the King William Undercroft to something like the same size as its twin beneath the chapel, currently used by students as a cafe (tip: the student caff is also open to the public if you’re looking for a cheap sandwich in Greenwich). 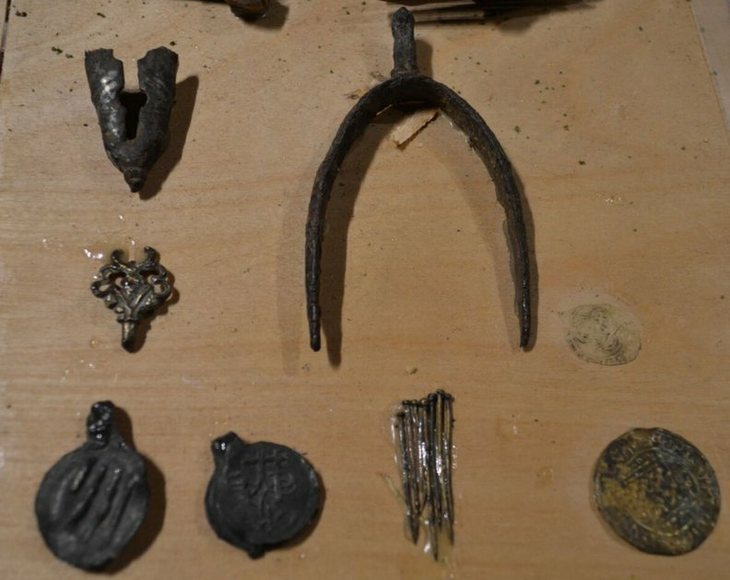 During the work, remains of the Tudor palace of Placentia were found beneath. Once known as the Chalk Walk for the underfoot crunching of tobacco pipes discarded by smoked-fuelled pensioners, the Ripley Tunnel runs underneath the street-level stone steps between the two buildings. 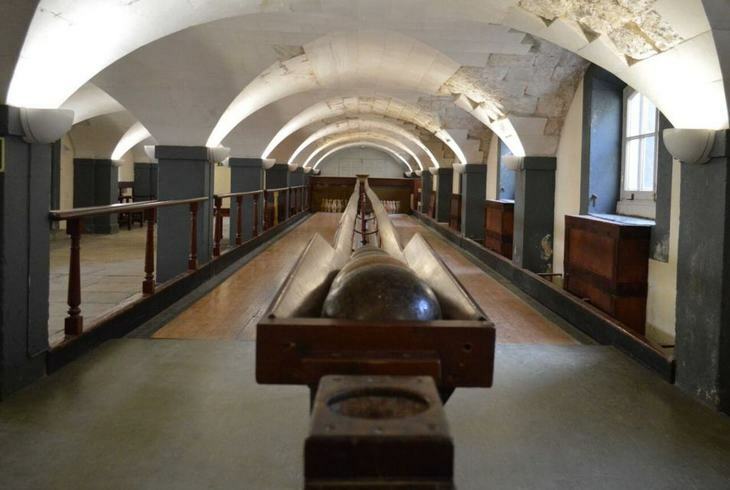 At the chapel end, behind a locked door, hides a double-lane skittle alley, built by the pensioners themselves in the 1860s and still boasting the original lanes, balls and pins. Some of the fake wooden cannonballs (made for training) are ridiculously heavy. None have finger holes, so you have to adopt a curious, double-handed, crouching stance and make allowances for the splintery potholes. There’s a simple, gravity-fuelled ball return, but mechanical pin-replacers were a marvel of the future. Someone has to stand in the sawdust pit at the back and put fallen skittles back manually. 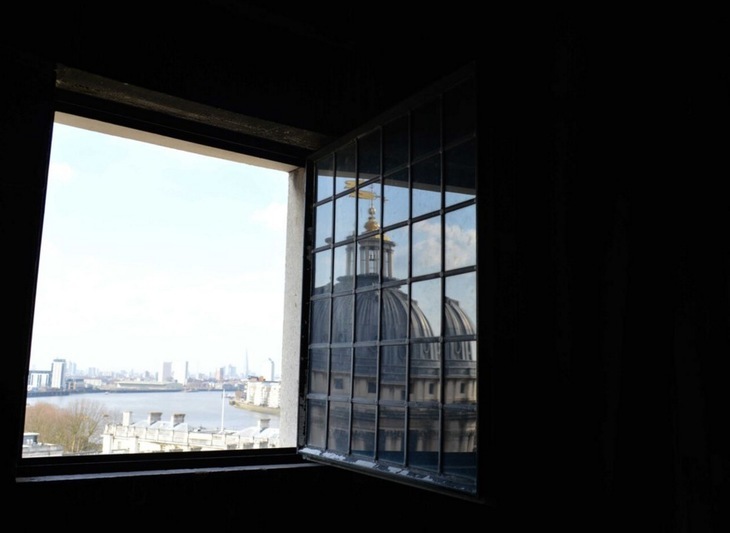 From the outside, Wren’s two domes look identical; small twin brothers to St Paul’s Cathedral. Inside they’re totally different. 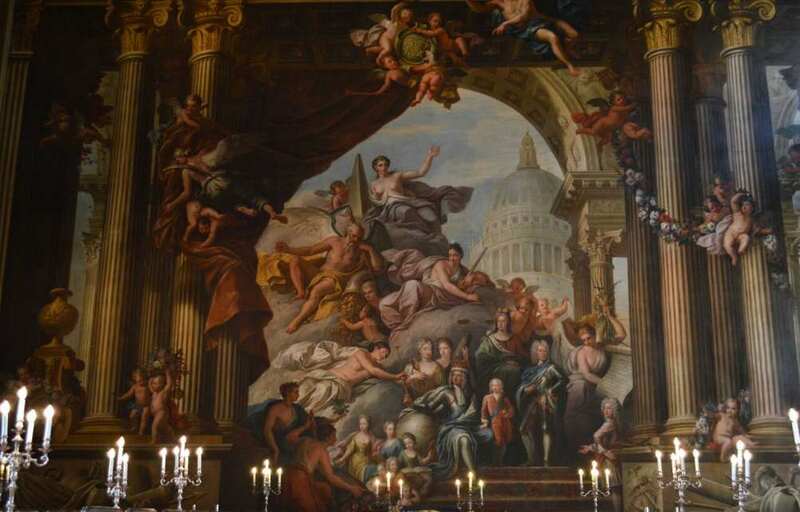 The Painted Hall’s version is completely open to view. Every opportunity for decoration is gleefully seized; every inch of plaster painted, gilded, curlicued and fluted. Across the courtyard, the dome over St Peter and St Paul is closed, dark. The chapel was gutted by fire not long after it was completed. Richly redecorated in 1789 by James 'Athenian' Stuart, its fine plasterwork, Coade stone sculptures and Benjamin West altarpiece have been big attractions ever since. The silent, secret walls inside the dome, however, remain soot-blackened to this day. 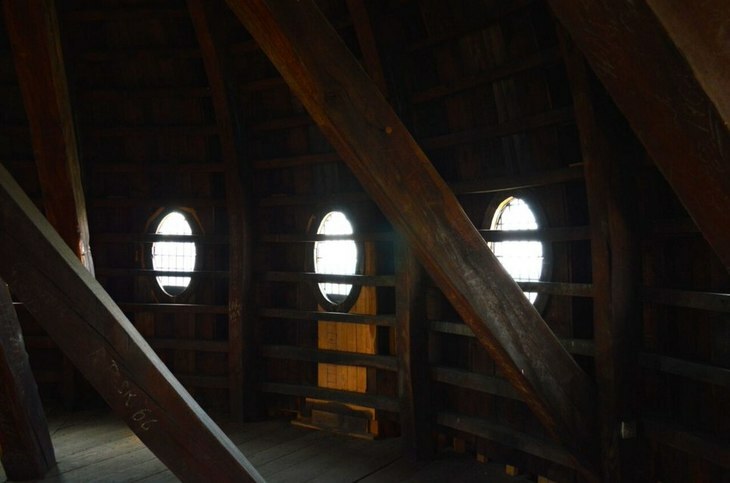 The tower has several variously murky and daylight-bright floors, joined by increasingly narrow spiral staircases. The first 'landing stage' up the tower, behind the entrance portico, is a large room scattered with the usual detritus old buildings acquire. 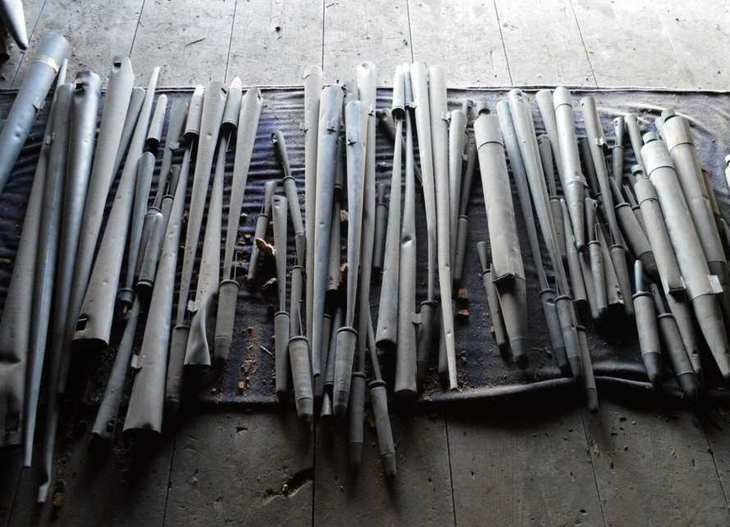 A set of dusty organ pipes. A filing cabinet. Boxes with scraps of broken architectural filigree, waiting for the day someone has a tube of superglue and a few spare minutes. The next storey (from the outside that's the bit with the pillars) is slightly smaller but with a high ceiling to accommodate full-length leaded windows. It houses more sundry bits of architecture: some abandoned steps; a relief moulding of an elderly god with a scroll and a chair no one in their right mind will ever sit on again. Up a ladder, inside a wooden case, sits the clock. Onwards, upwards. Things are now much shallower, more claustrophobic. If you’re checking this room from outside, it's the little circular ring of white Portland stone just below the dome-proper, with square windows like gun turrets, giving a 360° view of the surrounding area. 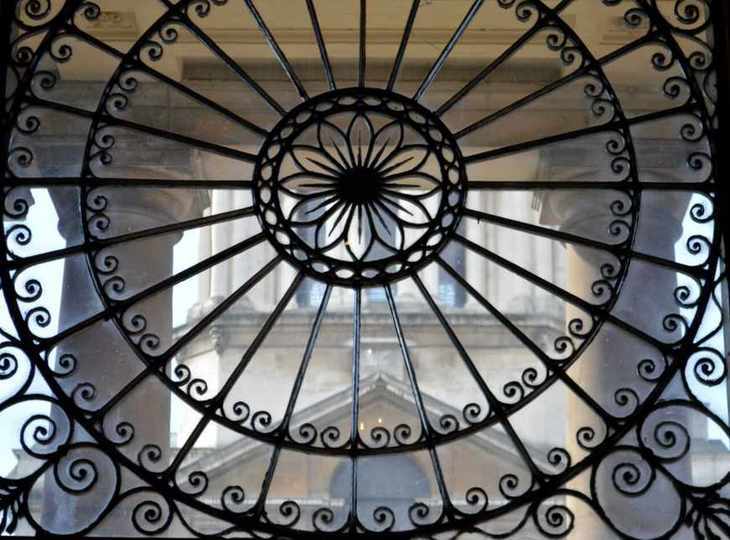 This part was used by fire-watchers during the second world war, an unenviable job given the Naval College was a special target for the Luftwaffe and its two domes the most easily spotted part of that special target. There’s chalked graffiti from the time — and before — on the wooden walls, some dating back to the 1830s. The only way to get into the dome itself is via narrow, steep, spiral, stone steps. The light here, illuminating solid timber curves, comes from small oval windows. A ladder continues up into the lantern, though the very tippy-top is currently blocked off. All that remains of the ancient Greenwich Palace, apart from foundations several feet underground, is a single cellar. 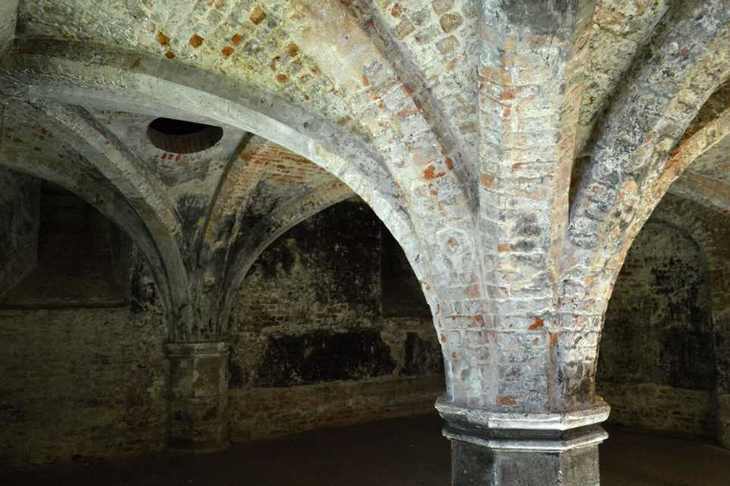 The Jacobean undercroft, built in 1603, probably to store wine, lies beneath the Queen Anne (north-east) building. It isn’t, somewhat inexplicably, open to the public just now, but still contains some glass exhibition cases from when it was. A passable but slightly amateurish model of the old palace enjoys pride of place and really rather good pin-spot lighting. The same lighting isn’t quite so kind to a set of nick-nacks, hap-hazardly stuck to a piece of hardboard or the bits of broken pottery and rusty knives glued to painted circles, presumably meant to represent plates. It’s easy to forget sometimes, just how far museum displays have come. 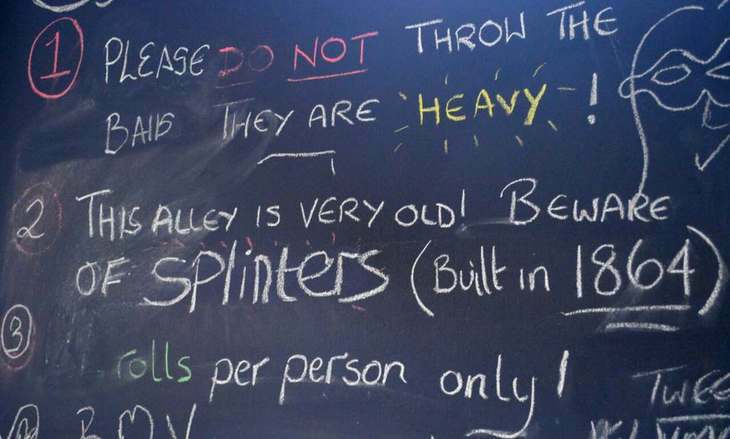 Discover Greenwich’s sophisticated presentation of the site’s history is a million miles away from gloopily-glued nails in dusty cases, but it’s oddly charming to see these old exhibits kept for posterity. In their own way, they too are part of the Old Royal Naval College’s history. The public tends to shuffle between the Painted Hall and the Chapel of St Peter and St Paul, pausing to snap the obligatory photo of the Queen's House before assuming that's their lot and trudging uphill to the Observatory. The public misses a lot. Just because this extraordinary group of buildings now houses a university and a music college doesn’t mean you can’t walk into the four usually-empty courtyards to find curiosities no one else pauses to see. No one will stop you taking a turn around the King William courtyard, for example, where a magnificent Coade stone pediment dedicated to Admiral Lord Nelson has just been cleaned up. 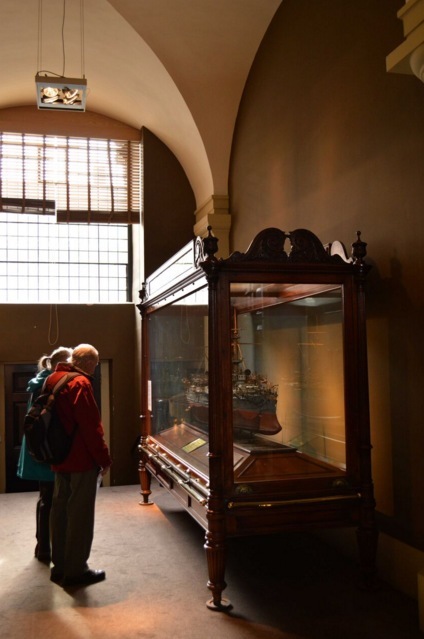 Slip into the Queen Anne Courtyard to find an old water pump and nip down the stairs at the Painted Hall to see a rather grand, if currently lonely cabinet containing a splendid model ship. 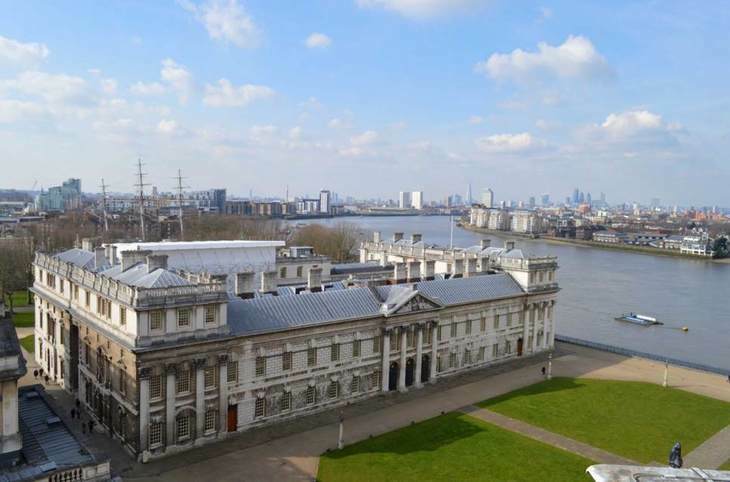 There are plans to reveal more of the secret treasures of the Old Royal Naval College from time to time. To open the skittle alley for bowling nights, for example, and create special events around the scaffolded Painted Hall. Just taking a turn around what’s there already, however, reveals a lot more than you might think. 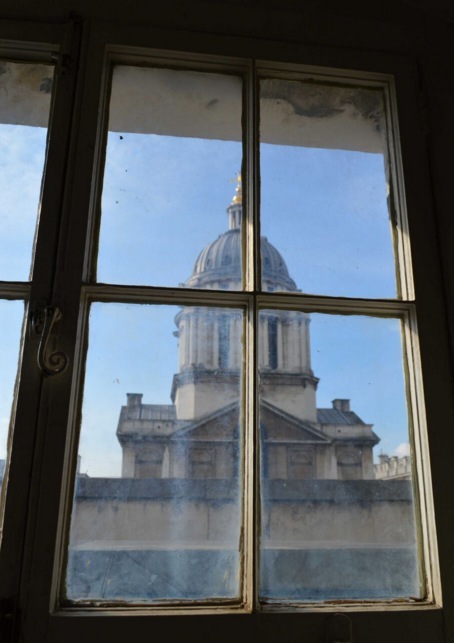 The Old Royal Naval College is open daily, admission free.